India has come a long way from being called a land of “snake charmers” and “naked fakirs” to become a contender for the Super Power title. Genesis for this transformation was laid way back in 1960s by India’s second Prime Minister, Late Lal Bahadur Shastri. He galvanised an entire nation to become self sufficient through his clarion call – Jai Jawan, Jai Kisan and delivered a body blow to Pakistan in 1965 Indo-Pak, which happened within three years of India’s morale crushing defeat at the hands of China. On the eve of the 50th death anniversary of Lal Bahadur Shastri, Mayank Jha charts the life and times of arguably one of the most unassuming but a visionary leader, whose life was mysteriously cut short in then Soviet Union in 1966. A documentary film and feature film based on the life of charismatic leader and former Prime Minister Lal Bahadur Shastri, whose death unfortunately turned out to be controversial, will be releasing soon in order to enlighten and us aware about the sacrifice he has made for the progress of the nation. Shastri was a man of sheer courage whose stature compared with other prominent leaders like former Prime Ministers Jawaharlal Nehru, Indira Gandhi and Rajiv Gandhi and many more, is not very much famous among the people of the country. But no one can deny his contribution for the nation and the political pundits who were aware about and have seen his work still rank him among the top leaders of the nation. “His decision making was crucial to phase out the country from famine crisis in 1960s, and had helped India to defeat Pakistan in the 1965 war,’ film director Aubrey Aloysius said highlighting Shastriji’s decision to support the Anand Milk Inion Limited (Amul) in Anand district of Gujarat and to set up the National Dairy Development Board (NDDB) which revolutionised the whole country. “The purpose of the documentary is to make impact on 1.27 billion citizens of the country. Anyone watching the documentary can encash their rich, inspiring and motivating inheritance and pass it on to the next generation. It is important that the children and youth of our country know and understand the life of Lal Bahadur Shastri, his everyday life as a child with meagre means, his struggle to get himself educated, a sacrificed life as a freedom fighter and a born patriot,” Aubrey said. According to Aubrey, Shastri was a man og high moral principles, values and ethics who with integrity and character crossed all bridges and held the highest Indian office with courage, integrity and utmost dignity. He was a legendary leader successful and blameless both in private and public life. Shastri’s thoughts and actions need to be perpetuated and carried forward in order that the life of Indian citizens and human beings at large can be transformed. His principles, values, ideals and thoughts must be held up as a lamp to India and the world. Even though he died 50 years ago, his legacy will live forever, says Aubrey. Aubrey said that recently on October 24 last year they celebrated the 50th golden jubilee anniversary of the famous sligan “Jai Jawan Jai Kisan” coined by Lal Bahadur Shastri in order to revolutionise the agriculture sector and to inspire the brave soldier of the Indian Army. This slogan had empowered India to g=face and repulse the Pakistan invasion of 1965. During the Indo-Pak war the then USA President threatened Lal Bahadur Shastri and told him to either end the Indo-Pak war, or else they would stop the supply of wheat. Shastri asked agricultural scientist how many days will Indians have to fast so that the country does not have to import wheat. The scientist replied, “if Indians skipped a meal once a week it was possible.” After this Shastri himself started fasting and even his family supported him in the cause. Thus ‘Jai Jawan Jai Kisan’ slogan is still relevant to India and our next generation, Aubrey said. People, specially our youth, always take politics in a negative way. Now after watching the documentary film on the second Prime Minister of India, the youth will be inspired by Shastriji’s work and will work positively for the benefit of the nation, Aubrey hoped. Indspired by Mahatma Gandhiji’s call for students to withdraw from school and government colleges, Lal Bahadur Shastri left his college and joined the movement for freedom. In 1930 he participated in the Salt Satyagraha lef by Mahatma Gandhi against the working of British rule. During the Indo-Pak war in 1965, Shastri gave the slogan “Jai Jawan Jai Kisan” to motivate the soldiers of the Indian army and revolutionise agriculture. He became a national hero following the Indo-Pak war. Prime Minister Shastri died in Tashkent in Soviet Union on January 11 1966 at 2am on the day after signing the historic Tashkent Declaration, reportedly due to a heart attack, but people allege conspiracy behind the attack. Q: What are your thoughts on Lal Bahadur Shastri’s career? What was the most highlighting feature about his career as Prime Minister? ANIL SHASTRI: The career of Lal Bahadur Shastri was fantastic and although his tenure as Prime Minister lasted on for 18 months but the quality of work that he gave during his tenure of PM, the politics he executed set the tone for a self-sufficient India. The most highlighting feature about him was his decision making and vision for the country. The ‘Jai Jawan Jai Kisan’ call given by Lal Bahadur Shastri as PM actually set the tone for the green revolution. This decision was important as it had sowed the seeds of Green Revolution in the country. Great stalwarts such as M S Swaminathan and Dr. Verghese Kurien joined his movement of self sufficiency. While on the one hand Dr Swaminathan started working on food sufficiency, Dr. Verghese on the other hadn had founded the dairy co-operative movement through Operation Flood. This has led the dairy co-operative movement in the country based out of Anand Milk Producers’ Union, popularly known as Amul. Q: What was your reaction when you came to know that there would be a documentary made on the life of Lal Bahadur Shastri? 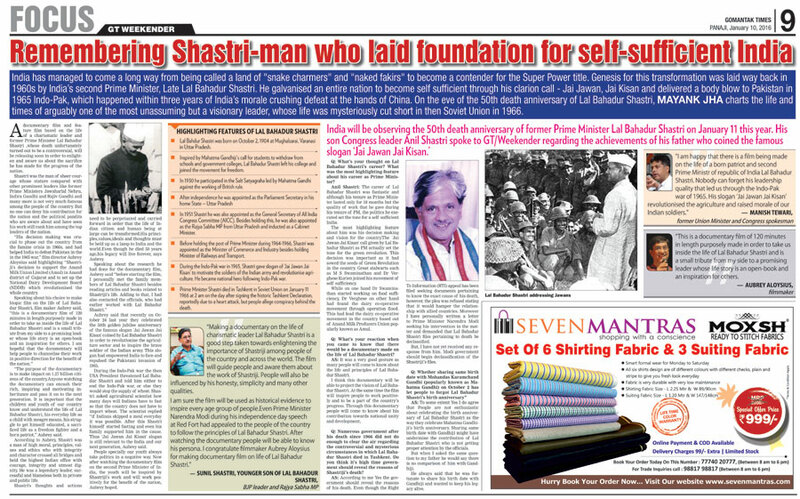 AS: It was a very good gesture as many people will come to know about the life of Lal Bahadur Shastri. I think this documentary will be able to project the vision of Lal Bahadur Shastri. At the same time the film will inspire people to work positively and to be a part of the country’s progress. Through this documentary people will come to know about his contribution towards national unity and development. Q: Numerous governments after his death since 1966 did not do enough to clear the air regarding the controversial and mysterious circumstances in which Lal Bahadur Shastri died in Tashkent, Do you think it is high time government should reveal the reasons of Shastriji’s death? AS: According to me, Yes, the government should reveal the reasons of his death. Even though the Right To Information (RTI) appeal has been filed seeking documents pertaining to know the exact cause of his death, however, the plea was refused stating that it would hamper the relationship with allied countries. Moreover I have personally written a letter to Prime Minister Narendra Modi seeking his intervention in the matter and demanded that Lal Bahadur Shastri files pertaining to death be declassified. But, I have not yet received any response from him. Modi government should begin declassification of Shastriji’s files. Q: Whether sharing same birth date with Mohandas Karamchand Gandhi (popularly known as Mahatma Gandhi) on October 2 has led people to forget Lal Bahadur Shastri’s birth anniversary? AS: To some extent Yes I do agree that people are not enthusiastic about celebrating the birth anniversary of Lal Bahadur Shastri in the way they celebrate Mahatma Gandhiji’s birth anniversary. Sharing same birth date with Gandhiji might have undermined the contribution of Lal Bahadur Shastri who is not getting proper attention from the officials. He always said that he was fortunate to share his birth date with Gandhiji and wanted to keep his legacy alive.